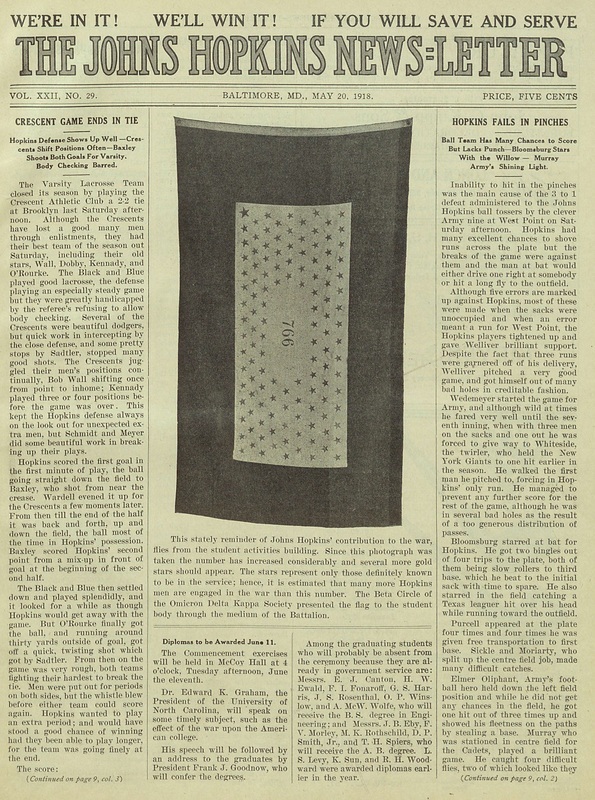 Though the war is discussed in the News-Letter as early as 1914, from late 1917 through spring 1918, the war dominates its content (following the formal US declaration of war on Germany on April 6, 1917). Updates on the ROTC were a regular feature, as were letters from Hopkins men serving at the front. 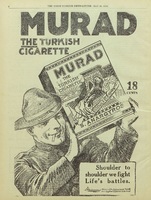 Even advertisements for razors and cigarettes were war-themed, and space was also devoted to ads encouraging the purchase of Liberty Bonds from the US Government Committee on Public Information. Articles frequently appeared noting which professors were working on behalf of the wartime effort in developing and testing gas and munitions, and other, more secret duties that could not be described. The JHU yearbooks from 1917-1919 reflect the war’s profound impact on the undergraduate student body. In 1917, the yearbook devotes ample coverage to the Reserve Officer Training Corps (ROTC) unit on campus, established as one of the first in the nation in 1916 in the drive for war preparedness. The 1918 yearbook shows a greatly altered landscape: one third of the junior class absent in the service, a junior Hullabaloo yearbook staff clad entirely in ROTC uniform, and a militarized design aesthetic, with a Hopkins seal backed by flags and stars and drawings of students in uniform. By 1919, the yearbook includes a list of Hopkins students, faculty, and alumni who died in wartime service. Yearbook editors took care to note which students still remained in the service, and which had returned home to complete their studies as veterans.